He did it! Haldan passed the exam! For those of you who don't know what I'm referring to, my husband has been in a schooling for the last 18 months through the nuclear power plant he works at. If he didn't pass this test he would no longer have this job. Pretty crazy. Needless to say, it's been a very anxiety ridden event. He started the exam at 8AM and he took 5 hours to finish it. Others took the entire 8 hours, so he had to wait to learn the results until they were finished. I asked if he was excited to be done. He said it was a complete let down, that he felt like the "guts of a sigh." To me that is relief. Never heard it put quite like that before. I wanted to have a celebratory dinner, but he said he wasn't hungry. 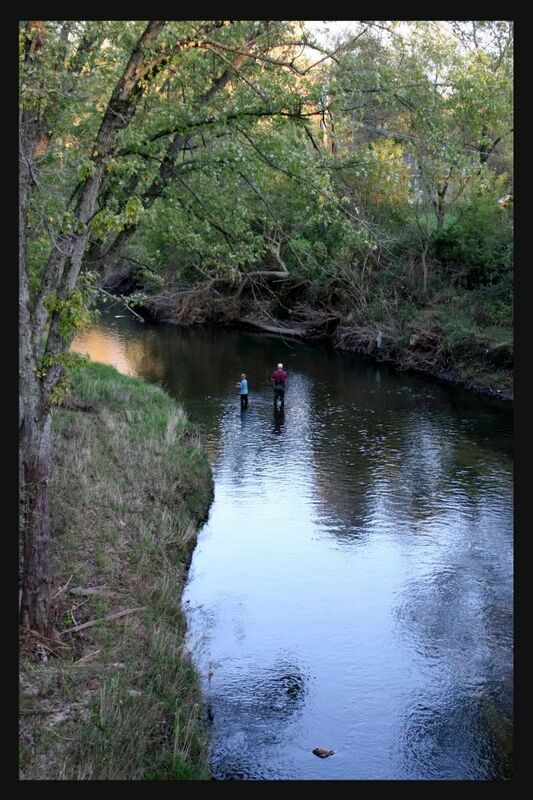 So, to celebrate he took Little Man down to the creek with his waders and spent the evening fishing. They came up empty handed, but a good time was had by both. In an attempt to get a POTD, I followed them down only to realize I wore the completely wrong shoes. Nearly killed myself trudging along the rocky, uneven path and then he liked the picture from the bridge the best anyhow. (It reminds me of a scene out of "A River Runs Through It.") It's crazy to think that a year ago that little creek was above that road. The trail is pretty messed up and not open for hiking yet. Now I know why. Haldan, I'm proud of you. I know it wasn't an easy course and that we have made it completely distracting all the while. Job well done. Now we wait for the official results from the NRC (Nuclear Regulatory Commision). He has yet to get his performance results, but he feels confident about that portion of the exam. In a month if all goes well he will be a Senior Reactor Operator. To the other 6 guys in his class who passed, Congratulations!! Congratulations Haldan! I'm glad you did "your best" :) It is nice to know that prayers are answered.